"Tri-Fi is well on their way to incorporating new style and strength to their already potent brand of piano trio music." For their second CD, Tri-Fi continue down a well-worn path of modern mainstream piano-bass-drums jazz trios, but have taken a few snapshots higher in the sky off those trails. Pianist Matthew Fries, an emerging young pianist is noticeably more engaged, focused, and working hard on expressing his inner voice apart from his influences. He also wrote five of the ten compositions, a standout being the introductory track “The Pumpkin.” Fries is leaping through a rhythmic patch of orange and brown, bopping incessantly in a fashion where a Charlie Brown boyish Vince Guaraldi meets sage master gardener Oscar Peterson, with a dash of the Miles Davis phrases to “E.S.P.” tossed in. Phil Palombi’s wry bass runs in tandem with the left hand of Fries. The stance of Chick Corea is also extant, but Fries modifies it in the hard bopped suspended tension of “Copenhagen,” the sprightly waltz “Grace” penned by drummer Keith Hall, and the conversely somber, moody, depths of despair shaded “Hatteras Reflection” (previously recorded by Fries on the CD Live @ 147). Hall also wrote the jumpy, witty “Creative Force,” and one of three features for saxophonist Steve Wilson, on soprano for Wisdom…First Things First.” The interplay between Hall and Palombi shows a seasoning and maturity beyond their years, and it is able to push Fries to lofty and attainable goals. The finale “The Heathrow Shuffle” is dedicated to a canceled flight, a blues with Wilson on alto sax that varies from a funky 7/8 shuffle to a bit nonplussed. There’s also a light samba “Postcards From Abroad” that is reminiscent of “I Concentrate On You.” These days, in this format, it’s tough not being derivative or resorting to lounge standards and cheese. 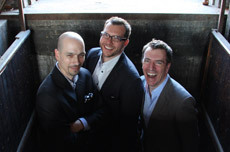 Tri-Fi is well on their way to incorporating new style and strength to their already potent brand of piano trio music. And watch out for Fries, or compare his work here to his debut recording Song For Today for the TCB label. He’s making great strides.